MOOCs: The New York TImes gets it wrong again; Europe is not lagging behind the U.S. According to Mr Smith, and one would assume, to the Times, MOOCs challenge the traditional classroom model in some important way. But how do they do that? The very idea of education as “knowledge transmission” is the problem in the first place. Yes, MOOCs transmit more knowledge to more people but knowledge transmission as education is exactly what is wrong with the standard university education model and most education of any sort. The idea that people can learn by being told, has been ridiculed by movie makers and by philosophers (like John Dewey and Immanuel Kant, not to mention Plato.) Still we persist. Do you know how many life rafts there are on a 757 and where they are located? Why not? That knowledge has been transmitted to you tens or even hundreds of times every time you board a 757. No one listens. Still we talk. What a weird idea. Teachers are important. Yet, teachers are exactly what MOOCs don’t have. The valid part of the classroom model is not the lecturing and not the tests, it is is the idea that there is a teacher present who you might engage in some intellectually stimulating way. The idea of school, at least in principle, is the interchange of ideas that cause you to challenge cherished assumptions and grow intellectually. This requires a good teacher. That is the teacher’s job, not knowledge transmission. MOOCs pretend to do this of course by having students talk to teach other, which is probably as useful as all the comments sections after a New York Times article. If the Times let one interact with the author of its articles and it we the author’s job to respond to every comment, then maybe the Times would show that it knew something about teaching. Perhaps the Times likes MOOCs so much because they are so much like newspapers -- great at the one way transmission of knowledge. told the conference that his university “was very strongly associated with face-to-face, and very expensive, one-to-one learning,” and was unlikely to change. High quality education, the face to face challenging interaction type, is very expensive to produce. Even the best universities offer mostly lectures. The reason: small seminars taught by famous researchers are too expensive to do too many of. They must be balanced by lecture halls that have a 1000 students even though most everyone knows this is not real education. On line learning will clearly beat classroom learning eventually. By on line learning I do not mean MOOCs. Why will on line win? Because one can produce authentic experiences, where students learn by doing, with mentors available to help student produce things, at less cost than it takes to run a giant campus. Build the best Search Engine Optimization course, or Data Analytics course, for example, and no university ever has to put up the money to build another. They just have to provide mentors for that course. They offer an experiential MBA that I built for them. No U.S. university would dare offer anything like it. Why not? Because universities in the U.S. are run by their faculty and faculties wants no challenges to the existing model. A faculty member may be happy to be the lecturer in a MOOC just for fun, but if that became their actual job they would be running for the hills. Faculty control of U.S. universities means they will never change since faculty have a pretty cushy life that they want to protect. But, this is less true in other countries where the bets university education is not private. The Times needs to stop thinking that the U.S. is at the centre of the university world. It may have that position in research but not necessarily in teaching. And, other countries may well be willing to change a broken teaching model that relies on knowledge transmission because their citizens are demanding it. Benito Juarez, Don Quixote, and Mexico City street kids; Really? I have just returned from a long trip which included Mexico City and Riyadh among other places. Riyadh was certainly fascinating in many ways, but my mind keep returning to Mexico. This is because the people who invited me to Mexico (Telefonica Epsana) made a serious mistake -- they invited me to visit a school. Now this wasn’t just any school. It was school for street kids, those who sweep up, sell Chick-lets, run errands, or do anything else they can to earn money. Telefonica had convinced the parents of these kids to let them go to school until noon, enabling them to work the rest of the day. Clearly Telefonica is trying to help, but the result isn’t so clear. They don’t have the freedom to design the half day they provide for these kids. The Mexican government, like all governments, still dictates the curriculum. So, the first lesson I heard was about what a wonderful man Benito Juarez was. The picture above is of the teacher asking questions of the class about Benito Juarez. Notice that the children are all sitting in front of computers, but they are not using them, they are hearing lecture/quiz kind of thing. They were using them at an earlier point to play with a jigsaw puzzle that had a map of Mexico on it that as far as I could tell was just abut finding pieces that fit and not really about Mexico at all. 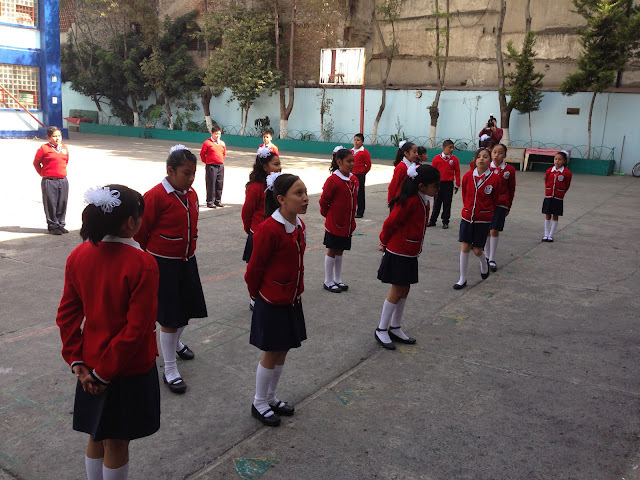 Later the students went to into the yard to sing a song about Benito Juarez and to march around while singing it. The next day I gave a speech about “the role of the teacher in the 21st century” which was the theme of the two day meeting. That speech can be found here. For years I have been pointing our the absurdity of the curriculum taught in schools. It is outdated and irrelevant to most children. But in Mexico, I saw a serious need for which I have much empathy and still the school authorities don’t get it. Really Benito Juarez? (I have the same point of view about George Washington by the way.) So, when these kids go back on the street (and quit school at 14 as I was told they all do) they will know about their national hero. They won’t know how to get a good job however. We could be teaching them how to run a business, how to program a computer, how to raise a family, how to find ways to make money -- really anything that might help them get out of poverty. But no, they sing about Juarez. Now I wish this were just a problem in Mexico but it is problem anywhere and everywhere. As it happens I speak in Spanish-speaking countries more often than I do in English-speaking ones, so I have learned what I can say that will drive Spanish-speaking intellectuals mad into to get them to think harder about what they are doing to kids. I always say for example, that they should stop teaching history. This remark is generally hated in Spain, but apparently I upset a few people in Mexico as well. But how accurate is the history we teach? Mexican history as I understand it is about Spanish occupation and the mistreatment of the local population, some of which is still going on as can be seen from the color of the faces of the children in these pictures. The descendants of the Spanish are not selling Chick-lets. If you look at the Spanish text in the last link you will see questions that the debates held after my talk have been centered around. One of these is about my remark that teaching Don Quixote is not necessarily the cleverest idea I ever heard. Don Quixote is required reading in Spain, and as far as I know ,in every other Spanish speaking country. It is defended as learning about their culture. How what happened in Spain in 1605 (or really a novel set in 1605) is of value to Mexicans who really have no need to know about Spanish culture I don't know. Many say that Don Quixote was the best novel ever written. Maybe it was . I don't know. I have managed to live a good life without ever having read it, which is probably true of most Americans (and American Intellectuals) as well. The only relevant question for me is how these street kids can be helped to live better lives. I don't get how making them read Don Quixote and sing about Juarez will help. Further I don't get why the Mexican government and the Spanish speaking intellectuals who argue with me about this, are not getting that idea that what they are doing is simply wrong. It is all well and good to have a view of education that says we need to teach our culture and history and where we came from but this idea flies in the face of reality. Culture and history is very nice for intellectuals. Let them have it if they want it. 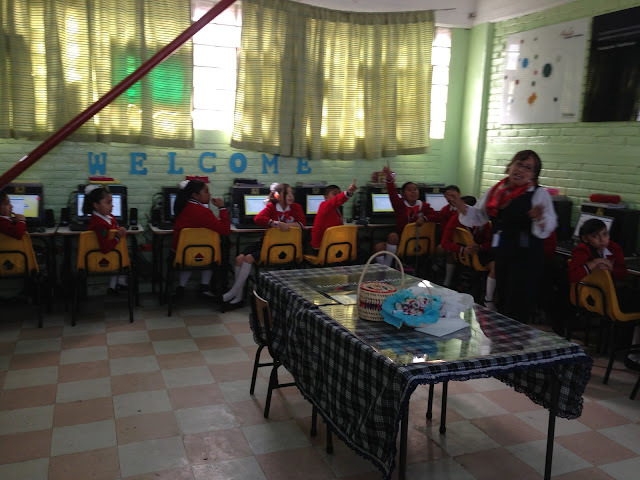 And maybe, through Telefonica’s efforts one of these kids will stay in school and become an intellectual. But is that really anyone’s goal? We have plenty of intellectuals. What about the rest of the people? What about the kids who will, at best, live ordinary lives? Why can’t we start teaching them skills that will help them with their lives and why and why can’t we start doing this now? Teach them to be healthy, productive, have some fun, think clearly, be good to others. Teach them life skills. Governments design schools to make citizens behave themselves, who won’t don’t threaten the status quo. But the status quo isn’t so good in Mexico (or in my country either frankly.) It is time we stopped trying to turn everyone into an academic scholar and help students become functioning adults who can earn a living, raise their children, and all get along with each other. Don Quixote wont help a bit in that kind of education and neither will Benito Juarez.